All the manipulation, distortion and suppression revealed by these emails took place because it would seem these scientists knew their belief was not only correct but unchallengeable; and so when faced with evidence that showed it was false, they tried every which way to make the data fit the prior agenda. And those who questioned that agenda themselves had to be airbrushed out of the record, because to question it was simply impossible. Only AGW zealots get to decide, apparently, what science is. Truth is what fits their ideological agenda. Anything else is to be expunged. Which is the more terrifying and devastating: if people are bent and deliberately try to deceive others, or if they are so much in thrall to an ideology that they genuinely have lost the power to think objectively and rationally? I think that the terrible history of mankind provides the answer to that question. Nixon was a crook. But what we are dealing with here is the totalitarian personality. One thing is now absolutely clear for all to see about the anthropogenic global warming scam: science this is not. One element of the Globo-Warmist fraud that hasn't been covered is the impact these revelations will have on certain eco-dogmas that have seeped into the Church. Many religious orders have wholeheartedly embraced "Saving Earth" as the 21st-century equivalent to "Saving Pagan Babies." Orders as traditional and as worthy as the Dominicans have signed on the United Nations Millennium Goals and the scary-scary Earth Charter. Both of these have laudable elements, elements easily and readily taken on by faithful Catholics (e.g., affordable medical care, education). But both also have elements that defy basic Church teachings. The UNMG has a well-hidden abortion/contraception agenda and the EC has an "equal rights" agenda that would require the Church to significantly alter basic moral teachings on marriage and family all in the name of "sustainability." Environmental sustainability makes perfect sense to any reasonable person. However, a major component of global sustainability is population control, i.e. abortion, contraception, and euthanasia. It takes about a minute of reading to see that both of these projects are inextricable bound to an internationalist-Marxist ideology. In other words, all of our problems will be fixed when we destroy liberal-democratic capitalism for the sake of Earth (no definite article, please). This is the totalitarianism Phillips is warning us about. So, the question is: if Global-warming is a fraud, what do the religious groups that have embraced this fraud do with their support for the radical social-engineering agendas of the UNMG and the EC? There's a fully equipped bar with Guinness on tap. On the other wall is a dazzling array of the finest cigars and chocolates. Then the priest comes in. "Father, forgive me, for it's been a very long time since I've been to confession, but I must first admit that the confessional box is much more inviting than it used to be." The priest replies: "Get out. You're on my side." NCR is reporting that US religious women are "almost universally resisting" the Vatican inquiry into the condition of their lives. I was struck by several elements of this story. First, participation in the Vatican inquiry is voluntary. How does one resist voluntary participation? You either take part or you don't. "Resistance" is something you do when you are being coerced into some action you believe to be contrary to your will. Congregations were invited to participate not coerced. The NCR article consistently uses the word "comply" and the phrase "not complying" to note the lack of participation. One complies or fails to comply with an order. One accepts or refuses an invitation. Second, the inquiry is an opportunity for women religious to tell the Vatican about their lives in their own words. The LCWR frequently complains that the hierarchy doesn't listen to women religious. What is accomplished by "resisting" this chance to tell the hierarchy how US women religious live? Future complaints about the Vatican "not listening" will be met with the question: "Did your congregation participate in the visitation?" Third, by participating in the development of the visitation report, congregations reserve a place for themselves at the table when the report is issued. Will those congregations that refuse the invitation to participate refrain from criticizing the report when and if it fails to represent their views on religious life? Does it make sense here to say, "If you didn't vote, don't complain about the election outcome"? Fourth, in an era when lack of transparency in secular governments and the scientific community is causing one scandal after another, LCWR criticized the Vatican for lack of transparency in the inquiry. Yet, many congregations complained about questions in the visitation document asking for the average age of the sisters and information about their assets and current financial situation. The Vatican dropped these questions. Why would congregations want too hide these bits of information? Isn't transparency a good thing? Several quoted statements from sisters in the NCR article go a long way toward indicating some of the root problems in the LCWR. "Vatican II took us out of the ghettos and into ecology, feminism and justice in the world," she said. "The Vatican still has a difficult time accepting that." This ignores the fact that the Church has always called Catholics to faithful stewardship of our natural resources; that the Church has been at the forefront of elevating and defending women against secular culture; and that the Church produced the notion of "human rights" and has always called for social justice. The real complaint here is that the Church has successfully resisted efforts by a radical minority to fundamentally mold the Church into a product of the '70's-'80's zeitgeist. One said that it is "unlikely the Vatican wanted us to come out of this being more confident of our identity as self-defining religious agents, but that is exactly what has happened." But we aren't "self-defining religious agents." We are members of one Body who use our gifts for one another. What happens to me if, as a self-defined religious agent, I define myself as something other than Catholic? If I have any integrity at all, I leave the Church and join a like-minded group. Catholics are defined by a tradition of teachings and practices that distinguish us as a group from other groups. To be "self-defined" is to be "not defined by the group I voluntarily belong to." If we are to be of one heart and one mind, we cannot be self-defining. "At first, many women were asking, 'How do we respond? Then we were asking, 'How do we respond faithfully in keeping with our identity?' And soon we were asking, 'What is that identity?'" This is exactly the point of the visitation! When a Dominican provincial or Master of the Order conducts a visitation of the friars, he is out to access the lived-identity of the brothers. Do they know who they are as Dominicans? Are they living out their vowed-identities faithfully? All along, said one woman religious, the challenge has been to respond to the Vatican in a way that breaks a cycle of violence. What "cycle of violence"? This is hysterical rhetoric and cannot be taken seriously. How exactly does a set of questions perpetrate violence? I guess the visitator could have rolled the papers up and smacked someone, but I doubt this is what happened. Calling the visitation "violent" is a fanciful way for congregations to paint themselves as victims of intimidation. Again, how does one violently request voluntary participation? I suppose the Vatican could have sent its cadre of albino Opus Dei ninja monks to kick in some convent doors. . .
One congregation, she said, cited a U.S. bishops' statement concerning domestic abuse in its response letter to Millea. "The point is, there have to be more than two choices: Take the abuse and offer it up, or kill the abuser." We are supposed to believe that an invitation from the Vatican to voluntarily participate in a visitation is the moral equivalent of wife-beating? Really? Truly, some of these sisters are living in a highly rarefied and privileged world of the imagination. To say, "I feel that these questions are violent" is not the same as saying, "These questions are violent." I feel like Bill Gates owes me a billion dollars. This does not mean that he does. I worked at a battered women's shelter. Labeling the visitation "violent" is an insult to women who suffer from real beatings at the hands of their out of control husbands and boyfriends. The women who came to the shelter with bruises, broken bones, bloody cuts, and real emotional damage would no doubt call B.S. on this statement. It goes without saying that congregations are free to think and feel any way they choose about the visitation. This goes for individual sisters as well. But these statements--likely not representative--portray the sisters as privileged, disconnected, rhetorically irresponsible, and, frankly, a little desperate to hide their lives from review. Do they see themselves as being above questioning? Above reproach? Isn't this the charge LCWR consistently makes against the hierarchy? Secrecy, lack of transparency? I doubt many of the "rank and file" sisters view the visitation as violent and intrusive. How many sisters sent in private evaluations of their lives that contradict the official statements of their congregational leadership? It is not uncommon in institutional structures for the leadership cadre to fear the frank evaluation of the "rank and file." We see this in unions, political organizations, men's religious communities, the Church herself, and just about any sort of group where the leadership can become disconnected from those they lead. The visitation report should make very interesting reading. And when I read a critique of the report from a sisters' congregation, my first question is going to be, "Did this congregation fully participate in the visitation?" If not, the critique is going to ring hollow. The institutionalization of Marxist ideology at the Univ of Minnesota's school of education. From the norms for admission and graduation of education majors at UM: "Our future teachers will be able to discuss their own histories and current thinking drawing on notions of white privilege, hegemonic masculinity, heteronormativity, and internalized oppression." IOW, you must first demonstrate that you are either already a Marxist or willing to become one before admission and that you have fully embraced Marxist ideology before you are allowed to graduate. This is exactly what we did in my English composition program when I was a graduate instructor. Will it pass constitutional muster? More global-warming pseudo-science! This time in New Zealand. If anyone has seen "The Road," please leave a comment with your reaction. I taught this Cormac McCarthy novel last summer at U.D. It is beautifully written; however, it is also terribly bleak and often downright gruesome. The flashes of hope manage not to be overwhelmed by the devastated landscape and characters. . .but the overall feel of the novel is nihilistic. It is a rare talent that can present apocalyptic despair in such hallowed terms. Suggestions for an alternative GOP "purity test." My fav: "Vampires shouldn't sparkle." Agreed! Heaven according to the Red-Bearded Convert of Seattle, Mark Shea. Being a feminist myself, I am heartened by this development on our university campuses. Hey, if Ted Kennedy can be a Catholic, I can be a feminist! If the right-wing hicks are right about global warming. . .??? The Anchoress busts a few heads over Climategate. Her conclusion? It's Bush's fault. But we knew that already. . . In a nutshell, Climategate is a destroyer of worldviews. The AGW/Climate Change question became a rigorous boondoggle that got out of control not because the scientist who first suggested a connection between human carbon emission and a change in climate were bad people, or that the question was not worth asking, but because bad people then took the uncertain hypothesis, put it on media-fueled steroids, demonized anyone who disagreed with them, made it political -so much so that even the scientists got caught up in the good/bad, smart/stupid, Gore/Bush, Left/Right identifiers- and found real power there; they allowed the AGW movement to become the dubious centering pole upholding the giant circus tent of their worldviews. As such, it is not permitted to be shaken. Shake the centering pole, and everything could come tumbling down: Oh. My. Gawd! If the Gore-doubters were right about this, what else might they be right about? And if they’re all stupid, and I’m smart, but they’re right and I’m wrong . . . If the true-believers of AGW got this wrong, and they’d attached it to all of their politics, all of their hate, all of their superiority, then everything is in a free-fall. This is a tidy explanation for the absence of any substantial coverage of the scandal in the MSM. Leaks for me! Not for thee. NYT bows before the altar of Global Warming Junk Science. Wow. At this rate he'll Bush-Ugly around Christmas. Lots of pics from the National Catholic Youth Conference. . .nice to see young Catholics happy! Science "works" in large part b/c the public trusts scientists to be as objective and open-minded in interpreting the data as is humanly possible. That trust disappears when scientists act like politicians. Sad analysis for those thinking about a Ph.D. program: "To put it another way, the most important function of the [Ph.D.] system, both for purposes of its continued survival and for purposes of controlling the market for its products, is the production of the producers." Diogenes, ever to the point: "Logic question: How could Bishop Tobin, by writing a private letter in 2007 [to Rep. Kennedy asking him to refrain from taking communion], escalate a public dispute that began in October 2009?" I don't think this is an attempt on the part of the RI Dem to undermine the bishops' opposition to abortion in the debate over ScaryCare. Nope. Not one bit do I believe it. This is NOT the fruit of Vatican Two but just part of the mess left behind by the "Spirit of Vatican Two" haunting the Church. Stay close to BXVI: God's Head Ghostbuster! Bishop Trautman is right. We are fighting a guerilla war. But, ummm, not against the side he thinks we are. Today's Coffee Spewing Pic! 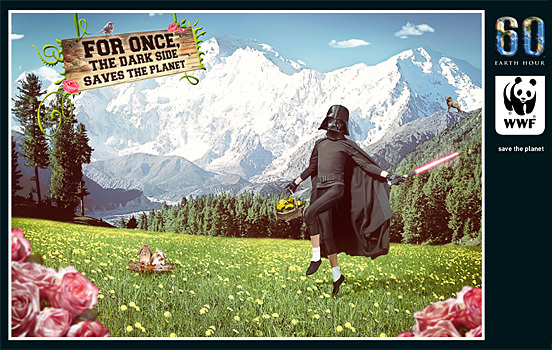 St. Darth Vader saves Mother Gaia. Buddhist recycling. . .they should try Maker's Mark bottles. This happens to me all the time. . .especially when I am reading philosophy. Ummm, how many ways can I say, "No thanks!" Anything that can be put together can be taken apart. Anything fixable is breakable. If it can be composed, formed, or united, it can be decomposed, unformed, and disunited. The material universe rises from the play of order and chaos, making and unmaking. You do not have to be a mystic to realize that impermanence is the way of all things. Visit a maternity ward. And then a graveyard. The two are inevitably bound together by the passage of time. Some of us find this truth to be a source of anxiety, a point for jumping off into the abyss of meaninglessness. Some are indifferent, challenged nonetheless by the competition to survive. And others are delighted at the prospect of death, rushing headlong to their end, encouraged by the possibility of immortality. Since humans started thinking about the purpose of their lives, each of these responses to impermanence—anxiety, indifference, and delight—each of these has had its philosophical and theological defenders. The gospel preached by Christ and his Church offers another alternative, another way to live the joys and pains of passing through God's creation: permanent renewal, persistent peace. Pointing to the temple and its splendor, Jesus says to the crowd, “All that you see here—the days will come when there will not be left a stone upon another stone that will not be thrown down.” For a people whose lives are centered on the worship of God, such a prediction must have shocked them. How can something as monumental, as stable as the temple crumble? How can our connection to God be thrown down? They want to know when this horror will occur and how will they know that it is coming? Jesus gives no date, no day and time. He doesn't even hint at a season. Instead, he points them to the impermanence of creation, the chaos of human life: earthquakes, famines, plagues, insurrections, wars, awesome signs from the sky. Had someone from the crowd yelled out to Jesus, “But these happen all the time!” Jesus would have answered, “Yes, they do.” Those with eyes to see and ears to hear would have taken his point. We are always in the midst of destruction, the failure of creation's fall. Therefore, put your love, your hope, your faith in the only place left untouched by the currents of chaos. Store up all you treasure in the promises of eternal life. Does this mean then that we must abandon creation to its fate? Do we run for the hills with our guns and provisions, waiting for The End? No. Though we may be tempted to hide from the world while we hold out against the enemy, our charge as followers of Christ is to save the world not abandon it. Jesus doesn't predict the destruction of the temple in order to warn the crowd away from its fall. He warns them of its collapse so that they will know where they should store their treasured faith. Not in buildings or votive offerings or adornments. But in their humble and contrite hearts. What our Father wants from His children is that we should live as if the temple has already been destroyed, as if we were already in His presence—face-to-face—daily, even now. Then, like Christ, our trust in Him is lived in the world as a sign of His love and mercy. We are His temples; we are His tabernacles. And as such we are—ultimately—indestructible. Christians do not have the luxury of anxiety, indifference, or a heroic delight in death. All of these abandon us to the currents of The Fall. All of these tell us that we have no purpose, no goal, that there is nothing more, nothing beyond the stones and mortar of a universe well-made to fall. Instead, we are vowed to travel through this world as living, breathing sanctuaries of His presence. Having placed all we love, all we hope for, all we trust in in the hands of the One Who brings us peace, we become His peace, the peace among wars and insurrections, tools for rescue and renewal. Yesterday, I posted excerpts from "The Manhattan Declaration," an ecumenical Christian Here We Stand document defying the Culture of Death. I lamented the absence of the opportunity for regular folks to sign the document. Fr. Dismas, OP drew my attention to the fact that regular folks CAN sign this historic declaration in defense of the Culture of Life! So, read it. Sign it. And keep on praying! Fr. Barron on 2012: Spoiler Alert! Fr. Robert Barron nails "2012" as anti-religious, specifically anti-Catholic and "boring." After being in "coma" for 23 years, Rom Huben was discovered to be conscious but immobile. New technology allowed doctors to ferret out his true condition. I can't begin to imagine what this must have been like. Twenty-three years of immobility! No way to communicate. Perhaps the only thing worse would be undergoing surgery while still conscious, or being buried alive. More than 150 prominent Christian leaders signed the Manhattan Declaration this last Friday, including many big name Catholic bishops. Reading through the document, all I can say is: "BOOM!" A large caliber shell has been fired across the bow of B.O. 's pro-abortion/anti-family agenda. What I find most appealing is that the language of the document is not USCCB bureaucrat-ese. It's plain, hard-ball You Shall Not Pass words of defiance. "We are Christians who have joined together across historic lines of ecclesial differences to affirm our right -- and, more importantly, to embrace our obligation -- to speak and act in defense of these truths. We pledge to each other, and to our fellow believers, that no power on earth, be it cultural or political, will intimidate us into silence or acquiescence." "We recognize the duty to comply with laws whether we happen to like them or not, unless the laws are gravely unjust or require those subject to them to do something unjust or otherwise immoral." "…We will not comply with any edict that purports to compel our institutions to participate in abortions, embryo-destructive research, assisted suicide and euthanasia or any other anti-life act; nor will we bend to any rule purporting to force us to bless immoral sexual partnerships, treat them as marriage or the equivalent or refrain from proclaiming the truth, as we know it, about morality and immorality and marriage and the family." You can read the whole thing here. My only criticism: too long. Most people won't take the time to read it. But the excerpts above are typical. Expect the following words and phrases to be used by the Left to characterize this document: "not helpful," "divisive," "separation of Church and State," "tax-exempt status," "narrow," "closed-minded hierarchy," "closes dialogue," "outside the mainstream," "failure to move forward," and other assorted euphemisms used in the rhetoric of anti-Christian bigotry by our Cultural & Intellectual Betters. Maybe we should agitate the signers to allow regular Christian folks sign it too. * "Gettin' buck" is slang for "preparing to fight." I may be showing my age here. This was popular not too long ago. There's probably a more recent slang-term, but it serves well enough. The future of the Catholic Church in the U.S.! 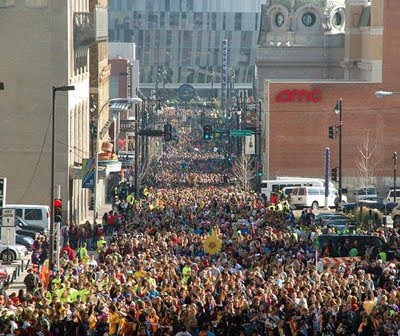 Eucharistic procession of the National Catholic Youth Conference in Kansas City. The recent hack (or was it a whistleblower?) of the Climate Research Center in the U.K. has not only exposed some of the naughty inner-political workings of the Global-Warming Alarmists, but it has also once again drawn attention to hacker subculture. I don't know much about this subculture--other than the romanticized movie depictions--but I admire it for its tenacity and innovation. As a counter-narrative to the dominant-narrative of computer programming, hacker culture keeps the Big Guys on their innovating toes. At the same time, hacker culture is dependent on the B.G. 's as a source of fodder and fun. Without Microsoft, the hacker would be placed in the very awkward position of being The Man. And a new hacker culture would form as its counter-narrative. As an old English teacher, I am fascinated by the way hackers have adapted the language to suit their creative needs. Of course, their innovations threaten standard usage, but standard usage is a lot like manners--what's appropriate and say and do at table with one's family is probably not said or done at table with strangers. Grammar, spelling, pronunciation, etc. like table manners depends heavily on circumstance and the contemporary goal of speaking and writing. Anyway, I think hacker jargon/culture gives us an amazing insight into both the dominant narrative of the internet world and its grimy underside. Check it out. Should we give to the CCHD? Catholics in the U.S. will be asked this morning to donate to the Catholic Campaign for Human Development. In the last few years the CCHD has been criticized for giving money to groups that support a variety of "social justice" causes that conflict with Catholic teaching. The bishops have assured Catholics that these groups have been de-funded. Here's the difficult thing. Community organizing groups often funnel grant money to secondary and tertiary groups that are not immediately known to the granting institution. CCHD may give $50,000 to "Save Our Neighborhood," who grants $20,000 to the "Park Project," who then grants $10,000 to the local abortion clinic for improvements to its security fence. Maybe some in the CCHD know about this, many don't. It's hard to track the money. Layers of groups with complex bureaucracies and innocent-sounding names, claiming to do worthwhile things can easily hide their activities from the original granter. I used to write grants for one of the largest public universities in the South. You wouldn't believe the layers of waste that the money has to filter through! People, first of all, should be prudent. They shouldn’t just jump to rash conclusions. I have seen some blogs that are excessive in their judgment of the issue and are harsh in what they say. Some of the members of the CCHD staff who have allocated funds from the collection have made mistakes, and I think the Campaign itself admits that. Whether these mistakes are frequent enough for people to be as upset as they are is a matter of the facts: They have to look what the facts are, not just jump to conclusions. People shouldn’t believe everything they read or be upset with the kind of intensity that I’ve seen, because I think that intensity leads to blindness. I think that people can contribute to the collection without worrying that they are supporting causes that conflict with Church teaching. At the same time, Jesus tells us that our treasure should be where our heart is. If people don’t like the decisions of the Campaign staff and their allocations, one of the ways they can show their displeasure is by withholding funds from their diocesan collections. It’s unfortunate that mistakes have been made, and I think the staff has to be more cautious and more critical in its judgment. There are many ways of responding to the situation. We bishops serve ourselves and the collection well if we are honest about mistakes, try not to make them again, and move on appropriately. Fair enough. So, give if you are called to it. . .but at the same time hold the CCHD accountable to Church teaching.